I was very satisfied with how this week went in terms of my goals. The intensity was not as high as I would of liked, but for a warmup week, I could not have asked for a better start. In the future I will have to step up the intensity a lot if I want to step anywhere near my goals. 8am : ¾ cup oatmeal w/ ¼ cup of raisins and 1 tablespoon of brown sugar. 230am: Medium to large Salmon piece w/ vegetables. The diet remained very clean through the week, I just need to make sure I do a better job recording everything this week. IMPROVEMENTS – 1. As stated above, better food logs. 2. Although its been clean, I need ot cut down meal sizes at night. 3. Does anyone know a good Iphone app for logging food? I had a good frequency with my workouts this week. The intensity was lower than I wanted, but for a warmup week it was easily enough work. I got measurements on Tuesday with my trainer. I left the sheet at home right now (blogging at coffee shop) but I do remember I weighed in at 215.5. I will get the rest of the measurements next week. I like the 3 on 1 off routine I have going alternating between upper body, core and cardio and lower body. Incline Crunches – 1x12 no weight (highest incline) 1x12 3 notches down. 1X12 all the way down. 90 second Plank circuit – 30 sec front, 30 sec side, 30 sec side in a row. X3 7/8/9.5 Last set I added an additional 30 sec front at end of circuit. Felt good. Realize its going to get long writing down each exercise, so I wont put you guys through that right now. Let me know in the comments if you guys do want that though. Thursday was Leg day which is the hardest workout by far. This was my laziest workout of the week cause I was distracted by the NCAA tournament the whole time so hoping to get a much better leg workout in today. Friday was my off day followed by upper body on saturday and core on sunday. WHAT I NEED TO IMPROVE – I need to plan ahead my movements in the gym better so I am not wasting time figuring out what to do next. I also need to step up the intensity more this week. Starting it off with legs today will set a good standard :D. Worked out with a friend last night also and found it easier to have a higher intensity. Just having someone next to you pushes you not to quit early and work harder then them, hopefully the felt the same and had a high intensity workout as well. POKERFinally, the part that most of you probably read this blog for. Not very happy with how many hours I put in this week. The NCAA tournament cut into my time a ton on Thursday and Friday Saturday. This week I shouldn't have that as much of a distraction with fewer games on. Plan on playing every day except Saturday since we have our Fantasy Baseball Draft (live Auction!). Stats for this week – 28 hours +$1570. Ended up right about the hourly rate I am looking for in the games I am playing. Was hoping for a lot more rake back this month from the promotion that Tulalip is running. They have 12 drawings every Wednesday and Sunday for $750 each. There are various ways to earn tickets such as playing in the nightly tournaments, or playing certain cash games or making a full house. I should have been drawn once or twice by now, but am empty so far. Wednesday is the last day I can make it for drawings so hopefully variance levels out. I loved this hand so much. Love every bit of my thinking through, but also considering the opponet. Ill try my best to do a Hand of the Week every blog, but this blog is already getting very long. Let me know what you guys want to see in the comments! Hand: QT o 3/5 nl. Preflop – Weak player posts dead BB and SB in middle position. He checks and I raise to $25 in the cutoff. Button calls who is playing about $1500 and is a winning player in the game. The button sometimes plays in the bigger games. I think he is a winning player and can hand read some but he is a amateur player afaik. Both blinds call and wee see a 4 way flop. I am playing about $500 effective and have been very quiet at a table where people a drinking a stacks are deep. Both blinds check to me and I decide to check since I will most likely only get 1 street of value on this board and want to control the size of the pot. Also the button player is the type who I might be able to induce bluffs from. I check and the button bets $60. Folds back to me I call. I still consider his range wide and feel I am comfortably ahead of it. I check. Button Bets $60. When he chooses the same bet sizing on the turn as the flop I am not liking the situation as much. I take out the nutted part of his range with this sizzing (QQ, 77,55,86). I also take his stone air bluffs out of his range (such as 98). I feel he has showdown value that he wants to ekk out another bet. I call though planning to evaluate the river and the price I am getting on the turn. Since I have the top of my range I feel folding it not a good option yet. I check. This river is one that I feel if he was bluffing he would continue. I also feel that the only hands that improve in the villains range is AQ and A7 and possible Ax he was barreling on flop and turn. Villain bets $110 into a pot of $340. I have $375. The key part to this river is I respect the villains game enough to value bet thin. I believe this player would bet KQ and AT hands on this river as my hand looks exactly like a weak queen or JJ. I feel that his turn and river sizing indicate exactly that he is going for thin value in my eyes. I feel calling here is not a option at all as I beat 0 value hands. I do feel though that I can turn my hand into a bluff profitably and fold out almost all of his value range other than sets and straights. I might even get him to fold a hand as strong as 57. I believe the villain will fold all of his 1 pair hands as I am trying to rep 2pair plus hands here. IMO no one in the 3/5 player pool EVER turns a made hand into a bluff on the river. He expects to see almost always NUTTED hands because that is what EVERY OTHER player has in the 3/5 player pool here. Obviously I am acting on a lot of assumptions here and I don't try this move against many players, but I felt everything added up here. Just felt this was a cool hand since the situation comes up so rarely at these stakes and stack depths. Weather is starting to look up here in Seattle. Currently writing at a coffee shop on the beach and the weather is awesome. This Saturday is our Fantasy Baseball Auction Draft in the league I play in every year. Looking forward to kicking all their asses and have been doing some research to get ready. Ill post the results in the next blog. Other than that though it will be the usual grind this week of Poker and working out. Looking forward to a better week this week and just keep improving. Ill leave you guys with 2 things. First is one of the coolest golf shots you will see from Bay Hill yesterday. 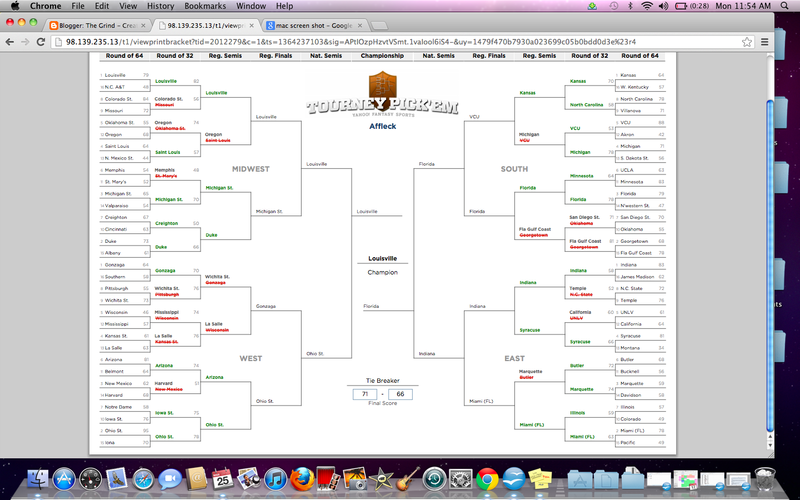 Ill also leave you with an updated picture of my bracket. It looks messy, but I still have a decent chance to make money in 2 of the pools since my final 4 is intact. LETS GO FLORIDA and Louisville! What you are missing is nailing or attempting to nail a few girls. Playing some sports with guys (join a few teams), it will make it easier to exercise and you will enjoy yourself more. Your 25, take Poker (your job) seriously, but give yourself a break and enjoy life more. The more your exercise, the more you can stop worrying about what you eat. If you get tired of measuring and logging food, and high cardio workouts then give marksdailyapple.com a try. I can't speak for everyone but I'll tell you it changed my life. Good for you dude. The better you feel... the better you will play. Also poker winnings will come and go but good health will always do right by you.